Oakey, an associate professor of chemical engineering at the University of Wyoming's College of Engineering and Applied Science, and his research group have developed an innovative method to isolate cells that are markers of cancer from blood samples. The cells, known as circulating tumor cells (CTC), are present in the blood of people with tumors in their bodies. The CTCs often migrate from the original tumor site and end up in other areas of the body, potentially growing in the liver, the brain or the lymph nodes. The spread of these cells and the creation of secondary tumors is the process of metastasis, and the treatment of the affected area ends up damaging all cells, including healthy ones. That makes isolating the CTCs an important but extremely difficult task. A sample of 1 milliliter of blood contains billions of cells, which could contain between one and several hundred CTCs. Current research tactics can isolate the cells, but they typically are mixed with other blood cells. "We are interested in developing a CTC measurement tool," Oakey says. 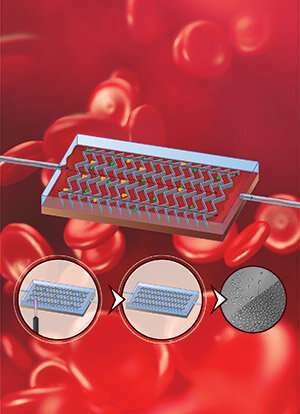 "It's based on microscale processing of blood. This is the proverbial 'needle in a haystack' problem. How do you find and isolate those CTCs?" Oakey adds that, currently, cancer treatment can be likened to a "shotgun blast of medicine" to the affected area, which kills off healthy cells and cancer cells alike, and results in discomfort to patients. Many research applications require that the cells come back alive and viable for lab cultures. Using Oakey's microfluidic device, blood is pumped in from one side into chambers and circulates throughout. As they tumble along the surface, certain cells stick to the microfluidic surface and stick if they display markers of cancer. Once the CTCs are trapped, they can be cultured and tested on an individual basis. The device also can be used to "count" the CTCs. For a person diagnosed and treated, CTC counts can indicate if treatment is working. The research also can be used diagnostically, to see what variant a tumor may have, so therapy can be individualized. The project was funded by the National Institutes for Health IDeA Networks for Biomedical Research Excellence (INBRE) Program over three previous years. "We've solved the problem of getting the cells back alive," Oakey says. 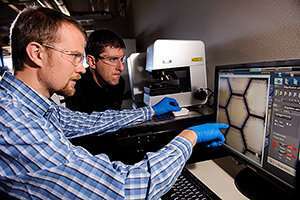 "We've done it by creating the hydrogel capture surfaces. When you shine light upon it, it degrades. The CTCs stick to the gel, along with some healthy cells. We can pick off the CTCs and flush them out of the device, and end up with live cells to culture. They are at 100 percent purity." Oakey says the next step is to move the research into a clinical setting. Once the CTCs can be grown in a lab, they can be treated with the latest chemotherapy methods to see how they react. The cells can be genomically tested to determine drug resistance, and researchers can use the method to learn about latent and aggressive cell types in an effort to determine how quickly and aggressively they need to be treated. "The goal is to see how different kinds of cells respond to therapeutics," Oakey says. "This research could guide cancer treatments toward individualized treatment strategies. Individualized therapy is very much the goal here."